Long ago there was an evil demon, Damyaan. He captured the beautiful, golden city of Sonapur and threw the people out of their own city. He then created his own army of Kaal Sainik's. In order to be immortal, he confined three spirits in three rings. Thus began his ritual of immortality. But the ritual backfired, and he got cursed and captured in his own kingdom. Only a human with a heart of gold and soul of steel could release Damyaan. In the meantime Skandi, Damyaan's minister, comes to Dholakpur and rules the king with the thought of gold. 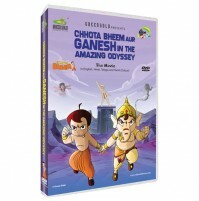 Bheem and his friends, led by the king and Skandi, go in search of Sonapur. Nobody knows about Skandi's hidden plan of freeing his master, Damyaan. Damyaan is finally free, and is unstoppable. Bheem realizes the entire plan was a trap. He must save everyone. 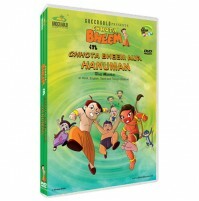 But how?This is a fun filled story of Bheem and his friends, who travel back in time to stop Damyaan from finishing his last ritual. 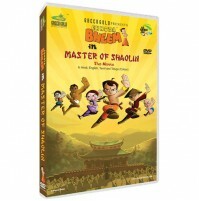 Read along and have fun!Playable on PAL supported DVD players / computers.Now at your reach! 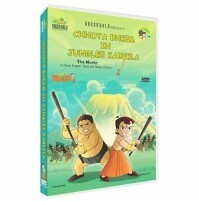 Bring home the fun, own your favorite Chhota Bheem series on DVDs and VCD's.